Nudge! 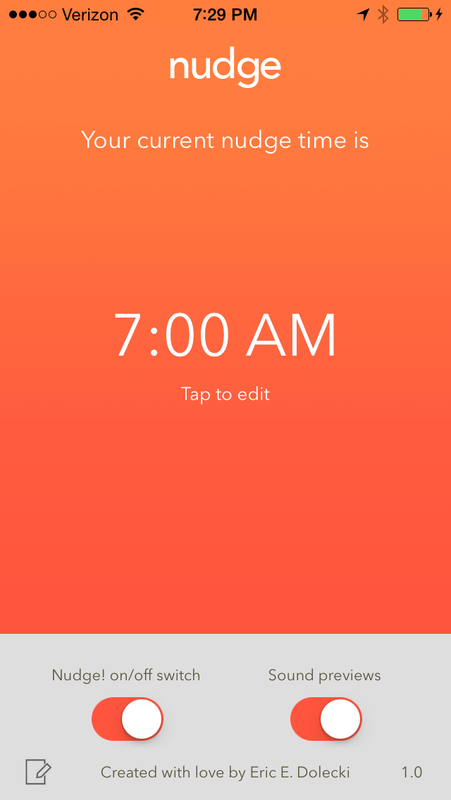 is a simple iOS application that allows you to customize the sound and message for a one-time local notification at a time of your choosing. It sounds once, so there is no snoozing. You can only set one Nudge at a time (no multiples with different settings). Need to remind yourself of something quickly? This is a handy tool. 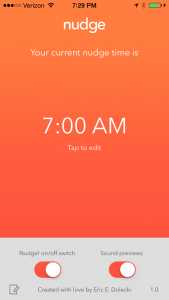 Set your time, choose some text if you wish, choose a sound to play. Make sure the nudge is set and turned on. That’s it. When the app is in the background, you’ll receive a nudge even if your phone is running another application or is locked. If your phone is muted (switch on the left side) you won’t be able to hear the nudge. Well, I just checked the App Store and searched for Nudge. Guess what, there is an application (pretty old from the looks of the screenshots) that basically looks like it does something similar to this, with slightly more complicated functionality. I had no idea there was one that was similar. I’ve been using Nudge! myself for quite some time before thinking of putting it on the store. Honestly. I haven’t tried the other application to compare. I still like mine quite a bit though, it’s been serving me quite well.